I've been in the Costa Rican rainforest for 12 days now and there's certainly been a lot of physical darkness to deal with since we've been having rain every day. That's life, isn't it? Dark moments, dark dreary days, dark seasons, dark circumstances and awfully dark spiritual times as we struggle to be faithful to God during this sojourn of life on earth. I love capturing a piece of Creation in a photograph. We all love many of the things God made, whether it be scenes of a sunset or beach or waterfall. Creation tells us much about our God and teaches us survival skills if we will be still long enough to listen. We generally lay out our desired paths in life mentally and then life happens and those concrete plans get broken up to make way for roots (trials) that will strengthen our soul or destroy it. Good photographs aren't easy to achieve in the canopy darkness of the jungle. At the end of the day I download and delete most of what I took. Thank God for digital cameras. Wouldn't you like to be able to do that with life's circumstances at the end each day? Life isn't all good as we stroll down the trails of this world. We have to scroll through and choose what to keep and what to discard and what we want to crop and edit. You may have to wade through a lot of debris that washes up on the shores of our lifetime, but that's where faith and trust come in. Sometimes our ego gets in the way and want to raise our fists towards God and say, "why aren't you making this all okay?" We want to scream out our prayers, begging for deliverance in that very moment of time. We expect, we give up, we wait, we run away, we hope, we say maybe there is no God. David, who went through some bleak times of life, said in Psalm 34:18 that "the Lord is near to those who have a broken heart." Brokenness will take you into the depths of God ... or away from Him. Pride tells us we want it now and when we don't get what we want, we stick our chin up in the air and move on. We have choices in life, don't we? Who will we turn to? Will we become better through our trials and tribulations ... or will we become bitter? Bitterness eats away at our mind, heart and health. Is that really a sensible choice? Trusting in an unseen God may seem ridiculous in times of darkness, but why would we choose an option that will totally destroy us and our relationships with others. Our Father is there watching over us. Jesus is with us. Our choice is to trust Him with our lives. 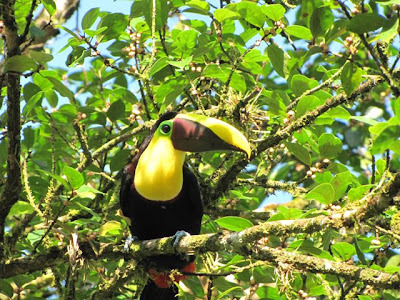 One of the things about La Selva is that you know there are always eyes upon you as you walk the trails. I don't get to see much of what's looking at me, but now and then I delight in seeing a creature that God made for our delight ... to show us who He is by what He created. He cares for the sparrow and so much more for you and me. 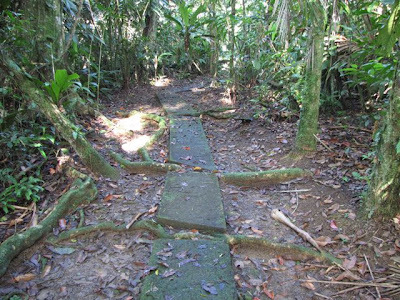 There are dark areas of the rainforest, but eventually you will come to an opening in the canopy. There is pitch blackness walking back to my cabin at night after dinner, but eventually I reach the light switch outside my door. 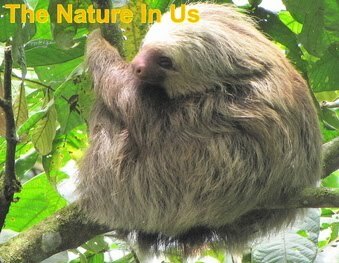 I see and hear about the destruction of global warming in our tropical rainforests. I must choose to let go of that, like the out of focus photos, because I can't see far enough on global warming, so I must turn that one into a prayer and release it to the Creator. Smith Wigglesworth says, "There are times when a stone wall seems to be in front of us. There are times when there are no feelings, when everything seems as black as midnight, and there is nothing left but confidence in God. What you must do is have the devotion and confidence to believe that He will not fail and cannot fail. You will never get anywhere if you depend on your feelings. There is something a thousands times better than feelings, and it is the powerful Word of God." 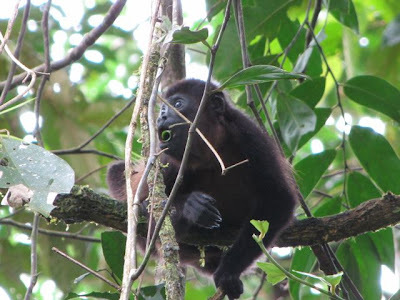 Just like this baby Mantled Howler Monkey, we have to feed daily knowing that someone greater is watching over us. He is faithful. He is God and sees all that we cannot. It always goes back to the Word. I know it's a big book, but the Holy Spirit will direct you to Scriptures that are just for today. Word that will get you through with peace. Remember the part of the Lord's Prayer in Matthew 6:11 that says, "Give us this day our daily bread?" That's how we must think about the Word. We need it's power and energy recharged within us daily. And when the jungle of life is really dark, you may need it several times a day. I love to make up Scripture cards (verses on index cards) and carry them with me. You can recharge throughout the day in many ways: in the bathroom, at the lunch table, while walking or exercising, while brushing your teeth or putting makeup on, and certainly before you turn off the light at night. Once you memorize the Word, you have access to it in an instant and can meditate as you drive, cook or clean. Darkness has no substance - it can't be measured. It's only there because of the absence of light. God is Light, so when you reject God, there is going to be darkness. But we can bring Light into any situation with His Word. It gives us life for each new day, regardless of how much darkness threatens to overtake and overwhelm us. Having a daily devotional for a few minutes each day is better than nothing, but it won't give you staying power in this jumbled world we live in. We need to feed on (meditate on) the Word for victorious living. Hebrews 4:12 says, "For the word of God is quick, and powerful, and sharper than any two-edged sword, piercing even to the dividing asunder of soul and spirit." You need to leave the soul (mind, will and emotions) behind when times are tough. It's only in the Spirit that we can have peace and joy in the midst of anything. Where else in the world will you get that outside the Word? God's Word is alive! It's eternal, always current, always pure and always true. Other spiritual writings fail when measured against these qualities, and they pass into oblivion, but God's Word is a discerner of the heart. It will help us to see the Light in all situations. God is good all the time. He can't be otherwise. Humans have free will and when people choose to do evil things, God is not in them. Evil exists in the absence of Good just like darkness exists in the absence of Light. God didn't create the world and man to have a puppet show. We make our own spin on it and He turns the evil into good - that's His promise to those who love Him (Romans 8:28). He has given us power through Christ to overcome any situation through His love and goodness. He sent the Word to heal us, sustain us and give us peace. It's a powerful weapon against our enemies. Use it! Pick up your sword today.